While most people now understand that the enhanced greenhouse effect means a much warmer planet, communicating regional shifts in weather remains a significant challenge. As with most complex science, nuance is everything. But how do you communicate complexity and nuance in a world increasingly geared to a 140-character limit? Over the next few days, we’ll be looking at the relationship between climate change and rainfall. Changing the chemistry of the Earth’s atmosphere is an uncontrolled experiment. By definition, providing a perfect picture of the outcome is a difficult task. Nevertheless, our understanding of physics and chemistry has allowed us to determine with a high degree of confidence the likely impact of these changes on the planet as a whole. In the long term — but rapidly by geological timescales — the Earth will continue to warm. Projected changes to regional weather patterns are much more uncertain. On the balance of evidence this uncertainty — including the possibility of abrupt shifts in regional climate — actually underscores the dangers of future climate change. However that is not quite the interpretation of some in the broader community, who interpret uncertainty in regional projections as serving to only reduce the risks of climate change. While this is a very strange framework for assessing risk, it has been pervasive enough to confuse efforts to communicate future changes, and distorts our assessment of certainty, uncertainty, risk and consequence. Recent heavy rainfall over most parts of Australia, and some of the conversation that has followed, has highlighted many of these difficulties. It is clear from the public discourse that there is both a general lack of understanding of the relationship between global warming and rainfall, as well as confusion around how future rainfall projections may or may not relate to current and recent rainfall variability in Australia. It is important to broadly understand that future projections, say for 2050, are not dependent on our experience of recent local weather events. This is because climate projections are not an extrapolation of observed data — they are based on what will physically happen if carbon dioxide in the atmosphere keeps rising. People understand this intuitively when it comes to their own health. When a doctor warns a young drinker in their twenties about the risks associated with heavy alcohol consumption over the next 40 years, that person tends not to respond that they feel fine now and hence the doctor is an alarmist. This is because there are very sensible things you can say about risk that are independent of the immediate perceptions of the individual. This is analogous to climate projections based on fundamental physics and chemistry alone. In this context, it should be very concerning to all that the climate system is already showing clear evidence of change due to increasing greenhouse gases. That is, the first symptoms are already clear. How will rainfall change under global warming? We need to set the scene before tackling this topic. Firstly, climatologically, there is a large difference between rainfall and temperature — and a large difference in our ability to provide future projections for rainfall compared with temperature. To understand this issue, we can use a bit of a thought experiment. If the Earth had a twin, and you added greenhouse gases to its atmosphere, it would warm up. In fact, any planet that was remotely similar to Earth can be expected to behave the same way. But could you use the Earth’s twin to understand how global warming will change rainfall on our home planet? The answer is yes, but only to a point. As greenhouse gases build up in the atmosphere, a general result would quickly become apparent. Our twin planet would have warmer oceans, and a warmer atmosphere — holding much more water vapour. Water vapour is itself a greenhouse gas, and is the key positive feedback of the enhanced greenhouse effect. Across the entire twin planet as a whole, there would be more rainfall. The rainfall is likely to be heavier, and rainfall variability more extreme. The equatorial regions would most likely be wetter, and parts of the mid-latitudes drier. The drier regions of the planet are likely to experience more severe drought interspersed by rainfall that is heavier — when it does fall. This result is known in the science as an intensification of the hydrological cycle. It has been a consistent feature of climate modelling over the last 30 years. It is the result that has been reported in every IPCC report published since 1990. But what does that mean for where I live? While an intensification of the hydrological cycle is a robust consequence of global warming, rainfall patterns over each region of the Earth are influenced by much more than just increasing greenhouse gases. Returning to our twin Earth, we can begin to understand why projecting rainfall over individual regions is a much harder task than projecting temperature increases. From space, the twin Earth would look almost that same as the planet we live on. However if you closely inspected the twin, even before you started increasing greenhouse gases, you might well find some strange things. You might find that its cycle of El Niño and La Niña events — the ENSO cycle — wasn’t exactly the same as our Earth. You may also find that the location of tropical rainforests and deserts was similar, but not exactly the same, from one twin to the other. This shows you how complex rainfall actually is. Weather patterns are a bit like personality; even the Earth’s twin will have slightly different weather and climate. Returning to our analogy of the young alcoholic — if he or she had a twin, and they both drank heavily for 40 years, it is likely that both would suffer bad health, but not identical symptoms. So while projecting that the Earth will warm up is relatively straightforward physics, predicting how rainfall will change over a single region requires a whole different level of scientific precision. Unfortunately, we don’t have a twin planet or a time machine. Fortunately, we do have Earth System Simulators and supercomputers. With these models, we can effectively create not just a twin Earth, but a whole family of Earth-like planets to experiment with. In this way, we can get an idea of how rainfall over Australia is likely to change by using many different climate models, and running simulations over and over again — to examine the mechanisms in the models driving the changes. These experiments have shown us a few things. The models cannot agree on rainfall changes across northern Australia, with some models suggesting wetter conditions, and others drier conditions, on average. This actually tells us something about the physical predictability of future rainfall in this part of the world. The models show that a range of different, predominant atmosphere and ocean circulation patterns are equally plausible for this region as the planet warms. The models are in much better agreement over southern Australia, which is expected to dry, on average, as the planet warms. This indicates that something more coherent happens to the atmospheric circulation in this part of the world, as you heat up the entire climate system. The models also agree that individual rainfall events will be heavier over most of the continent. This includes over regions that are expected to dry. Some of that sounds familiar. Isn’t this what we have been seeing in Australia? The above rainfall projections are not the simplistic “warming=no rain” scenario that seems pervasive in some public conversations. In particular, there seems to be less of an appreciation in the local media that warming is likely to increase rainfall, when averaged across the planet, and increase heavy rainfall events. In this context, the latest research indicates that we are already observing an increase in very heavy rainfall events around the world. Closer to home, observed increases in monsoonal rainfall and decreases in rainfall across southern Australia are consistent with a generalised wetter tropics and drier mid-latitudes scenario. The recent severe and prolonged drought (and by some measures a record drought), ended abruptly by record rainfall, is also consistent with projections for a warmer world. But before we get ahead of ourselves, it’s important to recognise that climate scientists have stopped short of categorically linking recent drought and rainfall to climate change. This is because recent events are essentially an intensification of the normal pattern of variability in Australia. When both climate change and natural variability push in the same direction, we will tend to break climate records, but – with the amount of global warming observed so far – it is still difficult to disentangle the contribution of either when it comes to rainfall extremes. Whether such disentanglement makes much sense is an open question. For climate scientists, it is more than enough to understand that every weather system and every ocean current operates in a climate system that is now almost 1 degree warmer than at the start of the 20th century. That is climate change. Whenever we break records consistent with a warmer world, we are getting some help from the enhanced greenhouse effect. In that context, some of the characteristics of recent local rainfall extremes are likely to have been influenced, at least partially, by a warming planet. The broader understanding of actual rainfall changes in Australia has also suffered from simplifications and misinformation in recent years. While many commentators have simply referred to droughts and floods, that description lacks nuances that are key to scientific investigations. Notably, drought conditions can be realised in many different ways. The most easily understood manifestation of drought is an absence of meaningful rainfall over long periods. However, in Australia — and particularly in those areas where rainfall is not high — many other changes in rainfall can lead to drought. One of the distinguishing features of Australia’s climate, in comparison to arid or semi-arid regions elsewhere on the globe, is the drenching that the entire continent receives on a semi-regular basis. For some parts of Australia, drought conditions can be caused by a prolonged lack of these very wet years alone, since those years are important to the normal hydrological cycle that ecosystems have adapted to. In a water-limited environment, a change in the frequency of future wet years, analogous to a change in the time between drinks, can have a profound impact. Then again, in water-limited environments, drought conditions can also be caused by a consistent lack of rainfall just in a given season, with normal rainfall over the rest of the year. An absence of wet years altogether. A systematic reduction in autumn and winter rainfall. These two factors exacerbated one another, leading to prolonged and severe drought and water shortages. However it is the second factor above that has scientists most interested. A 10 to 20 per cent loss of autumn and winter rainfall has occurred over both the southwest and southeast corners of the Australian continent. This is most significant in the southwest of Western Australia, where the changes have occurred since around 1970. In the southeast, similar rainfall reductions have been apparent since the mid 1990s. These changes are climatologically significant. Southern Australia shares a Mediterranean type climate. Most of the rainfall falls in the winter half of the year and summers, in general, are dry. The 10 to 20 per cent loss of autumn and winter rainfall has been amplified in the subsequent reductions in streamflow and water storages. There are many reasons for this, the simplest being that drier soils and vegetation soak up more moisture and therefore provide less surface runoff when rain does fall. The reduction in autumn and winter rainfall has been the backdrop to a prolonged sequence without very wet years. Again, the situation is most starkly realised in southwest Western Australia, where the last decent wet year was in the mid 1960s. This has systematically reduced inflows to dams and led to progressive depletion of water storages. For the southeast, rainfall over 2010 and 2011 has brought meaningful relief after 15 dry years. But it is important to realise that the recent rainfall was tropical in origin, and fell in spring and summer, while the long-term trend of reduced rainfall occurs during autumn and winter. In other words, the big wet year finally arrived—but the more systematic seasonal drying potentially remains. 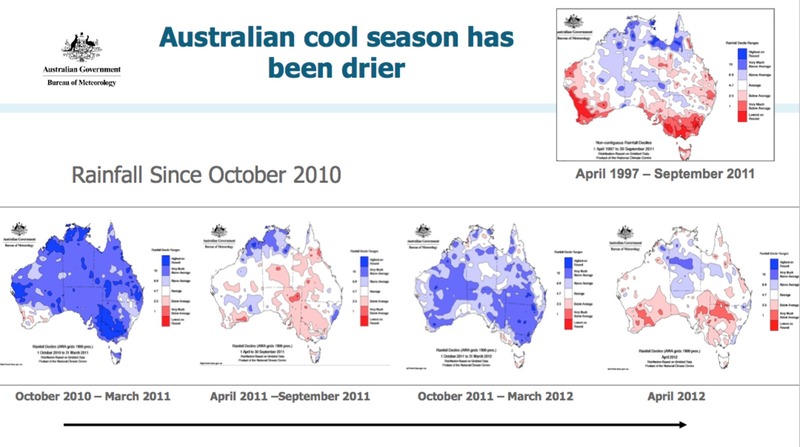 In fact, for the period April through September, it was drier than average across southern Australia in both 2010 and 2011. Since the start of April this year, coinciding with the end of the 2011-2012 La Niña, it has been dry again across large parts of the southwest and southeast. Western Australia is heading for one of the driest April-May periods on record this year. Tomorrow, Karl looks at the question of whether we can link specific drought or rain events, and drying over southern Australia, to climate change. Karl Braganza is manager of the Climate Monitoring Section at Australian Bureau of Meteorology.